The people have spoken, and, damn, they sound terrible. The fates—and our readers—have spoken. The semifinals for America's Ugliest Accent are here. Who's left? Two New England powerhouses, and two perennial contenders from the great state of Pennsylvania. Boston vs. Pittsburgh and Scranton vs. Providence: It's time to vote. The quarterfinals of Gawker's America's Ugliest Accent tournament continue today, right here. Who's worse: Scranton or Tallahassee? Which is uglier, New York or Providence? Vote here! 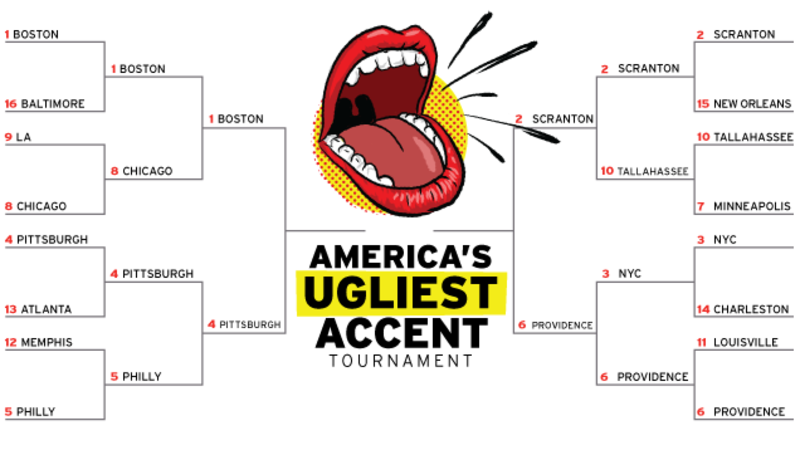 The long-awaited day of reckoning has finally arrived: Round One of America's Ugliest Accent comes to a triumphant close in. We are one step closer to democratically determining whom among us speaks with the most disgusting accent. It's that time again: voting in round one of America's Ugliest Accent Tournament is about to begin. We can now give you the results of our prior days' matchups, which may serve to inform where your loyalties lie in today's rounds of voting. Nevertheless, please remember that city pride is important when it comes to nominating the ugliest garbage-sounding mealymouth in America. Stay true to your school. Welcome to another edition of America's Ugliest Accent, where we as a country gather together to determine which of us in this great nation of disgusting vocal squalor has the least listenable accent. Every day this week, Round One of the Tournament, we'll be presenting two face-offs between cities. You, humble reader, will decide a victor. If you're from Philadelphia, your preferred non-Yuengling beverage is wooder. If you're from New York City, your greatest enemies are the bridge-and-tunnel crowd from Lawng Island. If you're from Los Angeles, you respond to people who hop on the 405 at rush hour with a pained "Whyy-ee?"